A nice, warm cup of Seattle coffee is usually enough to get me through a troubled day. 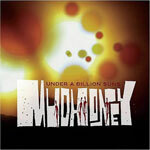 My latest cup is called "Under a Billion Suns" and it's Mudhoney's latest release with Sub Pop. It seems nothing had really changed in the Mudhoney kingdom, from back in the days when they were garage-rock knights till modern age when they are... Well, garage rock knights, but with a more variegated resume under their name. They still kick it, and "Blindspots" has even a Ska (!) feel to it. In days were old Seattle veterans are coming back to life (...If you can actually call Pearl Jam a LIVING band) - Mudhoney are still in the "fresh" category, forever young and always rocking.